WHAT I SMELL: Farnesiana opens with a thickened warmed mimosa that smells like woody plastic. The mimosa floral is dryish at the beginning only to open up to become rounder in a couple of minutes. There’s a subtle sweetness about Farnesiana that seems to be derived from a light almond like vanilla. It’s very dreamy early on and it feels very fluid. After around the 15 minute mark a hay like dusty quality makes an appearance which brings the fragrance more down to earth. At this point, the fragrance has an almost Play-Doh smell about it which sounds like something you wouldn’t want in a perfume, but it’s not full on Play-Doh, it just has a similarity. On top of the hay, there also seems to be a light layer of incense, which gives just a slight bite to the fragrance as it seems to waft in an out ever so slightly. After around an hour, the mimosa really comes full force and Farnesiana blooms into this very comfortable and pretty Mimosa bouquet that has a bit of projection, but not too much. Like many of the Caron parfum extraits, it takes a least an hour for the fragrance to settle into its beauty and when it does, its stunningly pretty. Created in 1947, Farnesiana was, at the time, one of the most exceptional and unique interpretations of mimosa on the market. Sweet acacia is a lesser known variety of mimosa, whose Latin name “Acacia Farnesiana” provided the inspiration for its name. It is reminiscent of Rome’s Farnèse Palace and the art of sweet, refined Mediterranean living. WHAT IT SMELLS LIKE TO ME: A Roman beauty. 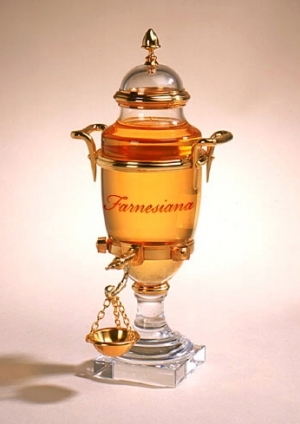 BOTTOM LINE: Farnesiana is very different; I can’t say that there is another fragrance out there to which I can compare it to probably because I’m not familiar with Mimosa as a primary note. In any case, it is a stunner for sure. Categories: Caron | Tags: 4 bones, Caron, Farnesiana, floral, fragrance, parfum, Perfume, review | Permalink. You know. I’m not generally given to mimosa. I’m not sure why, perhaps because in the wrong hands it can become too sweet, too gooey almost. A sticky sort of scent. And though I agree there is something of bubbling bakelite about this Caron in the opening, a wonderfully retro, plastic artificiality that almost seems natural it’s been around so long. It’s that peculiarity, that sense of this being thoroughly composed, constructed: Roman, yes, that’s what makes this so worthy of attention. Oooh, I love your description…”bubbling bakelite”…perfection! It is a strange other worldly beauty that does feel rather ancient, yet modern. It’s in a class by itself. Houndy, you really like your Caron perfumes it seems. I think I have a sample of this one. I’ll have to look and give it a go. I often like a Play-Doh note in perfume. I loved the stuff as a kid so it’s a happy smell for me. I wouldn’t want to smell totally like it but a little touch is nice. Poodle. At this rate I might just tattoo CARON on my chest. This does have the Play Doh effect, but just ever so slightly…. get out your sample and check it out.